How Do I Report on Website Availability? Below will walk through the steps of how you can view your website availability percentage. First, you will need to setup a website monitor for your application. For more information on how to setup a website monitor take a look at Monitors: Web Sites. Availability is calculated based on website monitors configured for the app. Make sure you setup a website monitor to use this feature. Once you have added the website monitor, you will get some new data on your dashboard showing website availability. Your website availability percentage will only go down if your monitor detects an Outage condition. Alerts will still be fired if the monitor detects your Warning or Critical conditions, but you MUST set an Outage condition for the website availability to be negatively affected. In the event that you need to do a complex action, such as logging in and possibly taking some other action, you should consider adding a synthetic transaction page created just to be monitored. That page will attempt the action in an automated fashion and report back success or failure, which you can also monitor (e.g. a page that tests the ability to log in, and if it fails it returns False, triggering an alert and denoting an outage). Just add another monitor for that page and it will automatically be included in your availability calculations. Once you have done that, all you need to do to get your report is change the time span in the App dashboard at the top right. 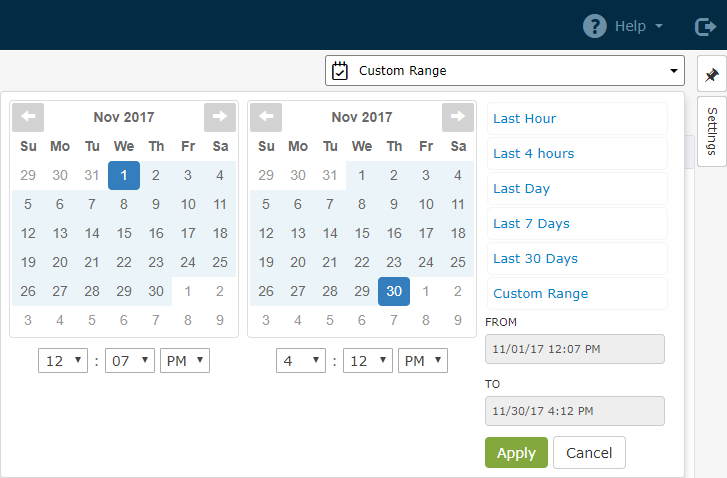 Choose Custom Range and make sure the dates are set to the month you wish to report on.